Alpine Vista K-8 opened its doors to students in the fall of 2013. We hit the ground running thanks to an incredible group of teachers and staff members, and we are well on our way to establishing a tradition of excellence. As the largest of 15 schools in the Tulare City School District, we serve students in kindergarten through eighth grade. 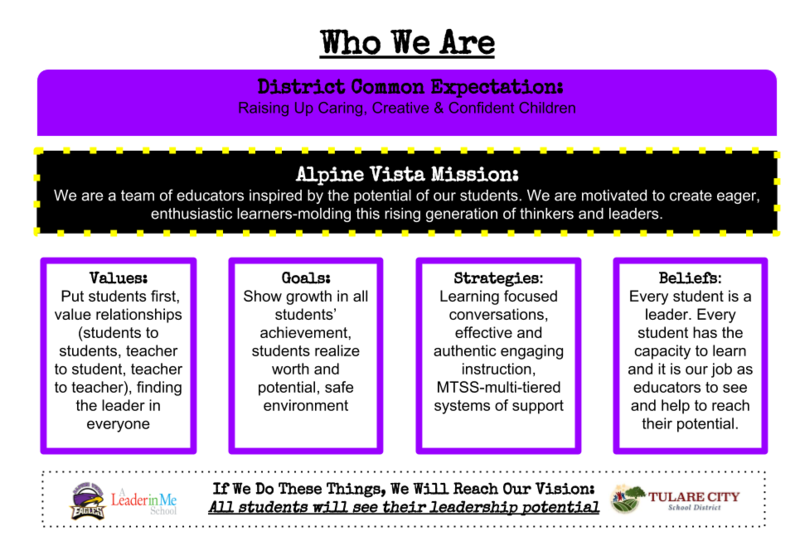 Alpine Vista is excited to be a Leader in Me school. The Leader in Me is a whole-school transformation model that improves the performance of all school programs. As a Leader in Me school, students, parents, teachers, and staff learn how to be responsible, show initiative, be creative, set goals and meet them, get along with people of various backgrounds and cultures, and resolve conflicts and solve problems. The Leader in Me will help students be the leaders of their own lives by learning the 7 habits: Be Proactive; Begin with the End in Mind; Put First Things First; Think Win-Win; Seek First to Understand, Then to be Understood; Synergize; and Sharpen the Saw. Leadership is not for a few but for everyone. Leadership is not a position. It is action - the actions we take every day. Let’s be leaders together and inspire greatness in our children. Our hope is that each of you will join us on this journey of greatness and make a positive difference in the world. 8:20 a.m. - 2:30 p.m.
8:20 a.m. - 3:25 p.m.
8:20 a.m. - 3:35 p.m.